Small dogs typically live longer than larger dogs, but they also reach adulthood sooner. This means your small puppy needs the right energy content to help support its immune system. 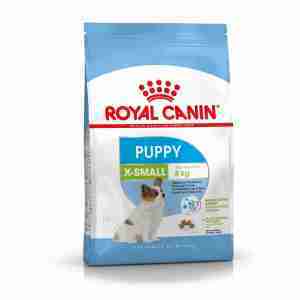 With Royal Canin they have developed a recipe that allows your puppy to grow gradually. This specially formulated recipe helps to facilitate good stool quality, with a balanced intake of fibres. The recipe is designed to meet the energy needs of very small breed puppies throughout the early growth years. The selected complex of antioxidants including vitamin E helps support your puppy’s young immune system and natural defences. As well as beet pulp and psyllium husks as fibres to support intestinal health, digestion and transit. All Royal Canin’s products undergo an extensive quality control process in order to guarantee the optimum quality of food as well as catering to your dog’s specific dietary requirements and lifestyle. I tried sooo many kibble types for my two Papillon pups and was at my wits end when a friend suggested RC. My boys LOVE it. I think it is because it's small and they can chew it easier than the big kibble I have tried, (Bob and Lush, Science Diet and more). I leave this down all the time and they eat what they want when they want. Super stuff.